Representatives from Somerset County Council joined Taunton Area Cycling Campaign (TACC) for a ‘Tour de Taunton’ to test out provision for cyclists in the town. The ride took place as the County Council prepares to start work on a new Cycling and Walking Infrastructure Plan for Somerset. 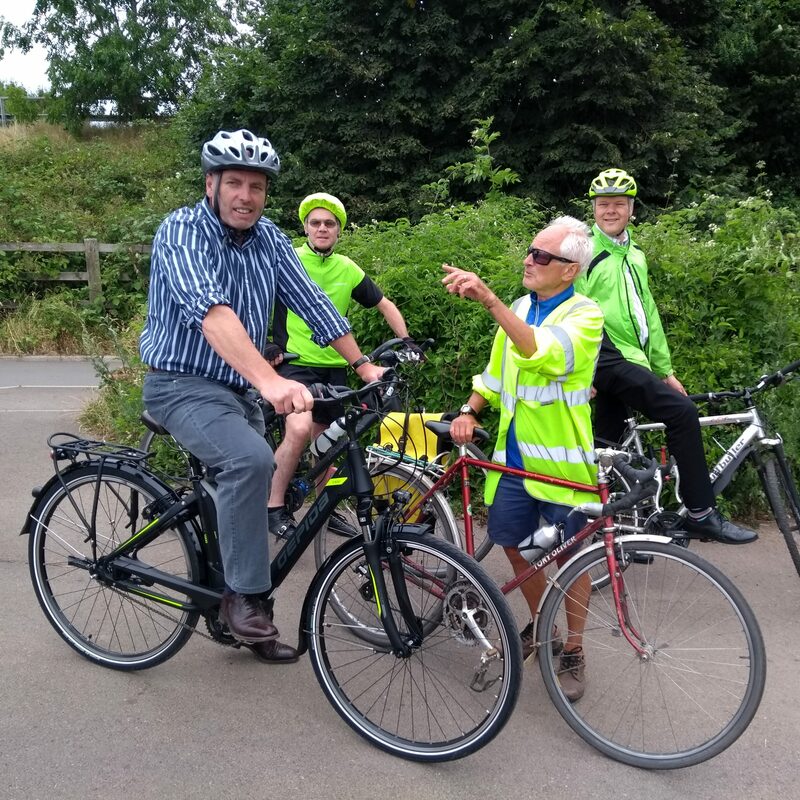 TACC invited Cllr John Woodman, Cabinet Member for Highways and Transport, to join them for a trip around Taunton to experience the good and bad of cycle routes in the town. He was joined by public health and highways officers on a circuit from County Hall via Wellington Road, French Weir, Trenchard Way, Winkworth Way, Duke Street and the Parade. The tour highlighted the challenge of fragmented cycleways alongside main roads, locations where cyclists have to give way to minor roads, and busy junctions at Compass Hill and Priory Park roundabout. It also highlighted good cycleway design, such as at Winkworth Way, where there is a separate cycleway and pavement. The group discussed the need to connect the network where there are missing links, to enable people of all ages and abilities to cycle without fear. Cllr Woodman said: “We all want to make life easier but of course we have to work within our restricted finances. This trip was a really useful exercise and a great opportunity to see the town from a cyclist’s point of view to see what could be improved. “Cycling has huge benefits in terms of health and fitness, which is great news for individuals and the NHS and social care. We also know that encouraging people to cycle helps reduce traffic congestion and pollution, which is particularly important in Taunton as a Garden Town. Cllr Woodman borrowed an e-bike for the tour, kindly loaned for the day by Nationwide E-bikes on Priorswood Road. E-bikes have a rechargeable battery and motor providing variable assistance for riders and allowing almost anyone to get on their bike. TACC’s Mike Ginger said: “Our 2016 survey of cyclists highlighted many problem junctions and examples of network fragmentation. It was great to be able to show these issues first hand to those in a position to change things.